Eeeeep!! Okay lovelies ~ I am sooo super excited to bring you this unboxing video. I had to wait a while before I had the chance to sit down and do the filming, but it was so worth it. I recently purchased my very first pair of Irregular Choice heels ~ the “Mal E Bow” in Rainbow ~ after drooling over the unique and amazing styles of their designs for quite sometime. The gorgeous Irregular Choice pieces do tend to sell out fairly quickly, and these shoes really are pretty special, so I hope you enjoy the “live” peek at them! And, yes, I’m wearing the same outfit as in this last post which I think is kind of cool, because you can get a better look at how that presents “in person” too. Isn’t it so funny how nothing quite looks like photographs, or like videos for that matter, as it does in reality? Indeed, I've been struck by that as well. Some things are better, some are "worst" (as in, not as good as you might have imagined), and some are very close to reality, yet not quite there, even on video. I'm surprised actually in this day and age of fashion bloggers and YouTube, plus countless selfies taken the world over everyday, we don't see this topic raised more often. What fabulous shoes!!! I've always dreamed of owning a pair of Irregular Choice shoes, too. Congrats on your first, they're awesome!!!!!!!!! Totally! And even when the issue of a 'curated' reality is addressed, I think the actual facts of how pictures, and even videos, are really only a 2 dimensional representation of how something appears are often glossed over ~ I say two dimensional because I feel like you can never quite capture the full, true story. It's much easier to create something entirely different then it is to capture an accurate representation I feel! Yes, that's always the risk buying shoes you can't try on! Can you shop IC in store though? Do they even have a shop front? I don't think they do but they do turn up in a few places in the UK like Schuh. But not usually very many styles... Such a shame! Hello! I am a vintage blogger currently living in South East Asia with my family. As a busy mom traveling with three small children, this is one place where I can share my love of wearing pretty dresses and vintage fashion. My philosophy for fashion is "Find beauty in life, and reflect your own true, beautiful self in your style." 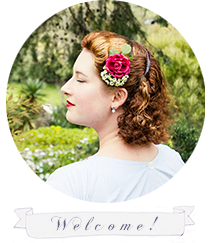 I firmly believe that vintage and retro fashion is for everyone! Ladies of all ages and walks of life, and I want to share that in my style journey, and I hope to inspire others in theirs!